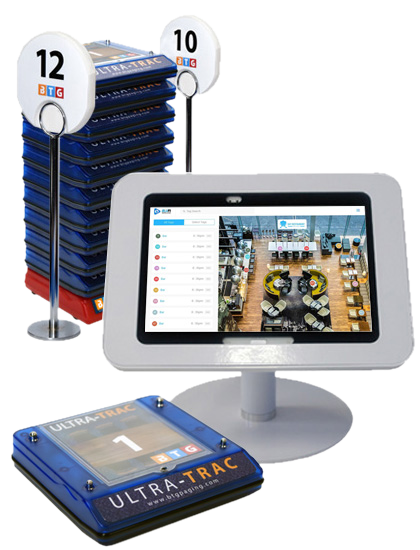 Ultra-Trac is our Real Time Location Tracking guest pager system which allows staff to locate and deliver the guests meal/order wherever they are in the venue. The Pager Location is tracked in ‘real time’ throughout the venue and shown on a Smart Tablet available to staff. With the Ultra-Trac system guests are free to move about the venue and staff can always find them. Each Ultra-Trac pager contains a tag which has a unique signal. Using a series of anchors within a venue to triangulate the signal, the Ultra-Trac pager is constantly visiable in real time. As customers move around the venue with thier Ultra-Trac pager, staff can see their location and when the meal or drink is ready, deliver their order directly to them. Why buy when you can rent it first and then buy it if you like it?